Walking into a cigar humidor for the first time can be very intimidating, whether you have cigar knowledge or whether it is your first time in a shop. While most shops I frequent have great staffs to help you navigate through their selection, it still helps to know some of the basics to aid in making a decision about your purchase and having a pleasant experience so you’ll come back. Until you have partaken in several cigars, it will be impossible to decide on a “go-to” or a favorite. Because everyone has a different pallet and senses different tastes, you will only be able to decide for yourself what is and isn’t a “good” cigar. Aficionados (enthusiast), publications and websites offer reviews and suggestions about taste, strength and flavors, but until you’ve tried it, those opinions hold very little weight. Just like shopping at your favorite clothing store, the more well-known brands and manufactures will get more shelf space and will be more prominent. Many of the larger brands have a little something for everyone, and mentally you’ll feel “safer” starting off with something popular or familiar. Once you have the fundamentals down, then we can start experimenting for complexities. Pay close attention to the construction of the cigar. We will discuss how to properly light a cigar a little later, but a huge factor in whether or not you’ll have a good experience is how well the cigar has been maintained in transit and by the shop. 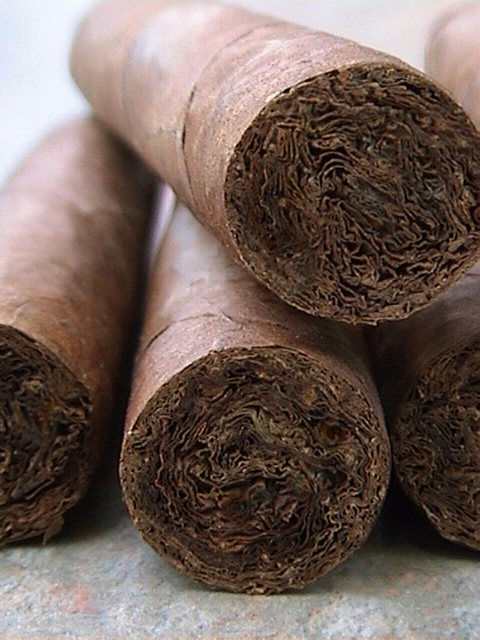 Beware of cracks, holes and tears in your wrapper, as these will cause the cigar to burn sporadically and unevenly…ultimately resulting in an unraveled mess of leaves in your hand. Don’t be afraid to ask the shop staff to cut and light the “stick” for you. If you are unfamiliar with the properly techniques or don’t have the right tools, don’t sweat it. It’s easy to learn and supplies are available. If you’re there with an experienced friend, they’ll be more than happy to assist. No one that enjoys cigars wants to see you struggling and not having a good time with one. The draw (puffing) is impacted by the cut and the taste will be significantly altered and distorted depending on how it’s lit. If you value your throat and lungs, do not inhale the cigar smoke. These are not large cigarettes and they are not to be smoked in the same manner. While you will feel the effects of the tobacco, this can and should be done by simply holding the smoke in your mouth for a few moments before slowly blowing it out. The point is to taste the different blends of tobacco and the flavors that the combinations produce. Take your time. Cigars are meant to be savored and not rushed. If you are in a hurry, stressed, upset, depressed, etc., don’t waste a great cigar. The longer a cigar burns, the better they get as the favors become more evident the further into it you get. Similar to slow roasting a special sauce, the ingredients need time to work together to create to create a flavorful masterpiece. Learning and enjoyment comes from trial and error. Cigars are an acquired taste and it takes months, even years to develop a taste for what they have to offer. It’s a lot easier to understand the fascination and allure if they are approached with an open mind and the willingness to learn and enjoy. Enjoy!